TVT! Records President Steve Gottlieb and Director A&R Michelle Oakes signed Danish alt-rock act The Blue Van to a worldwide deal. The Danish quartet worked with noted Danish artist development entrepreneur Manfred Zahringer (founder of Iceberg Records). Zahringer tells A&R Worldwide, It was a long and exhausting negotiation with TVT! I must say Steve Gottlieb is a tough negotiator [laughing]. Both Steve and Michelle traveled to Copenhagen to experience the band live and I realized then that they were serious about signing the band. 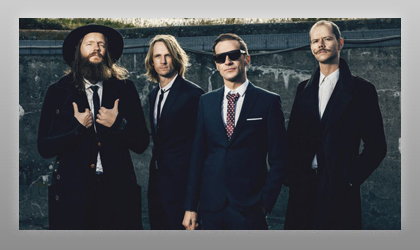 It's not very often that a Danish rock band signs with a U.S. label, so we had every reason to be proud of the deal. I would like to thank A&R Worldwide for its help in getting the word out about the band very early on. The Blue Van's support from A&R Worldwide and its exposure on the A&R Worldwide newsletter helped put the band on the music industry radar, which resulted in interest from A&R executives from within the U.S. and Europe. Michelle Oakes states, "I knew as soon as I heard the first snippet of their music that I had to sign The Blue Van. I am extremely excited about the future of this band."